The Eritrean Assembly was located at what is now the Ministry of Education. As a small child I used to run up on one side and down the other side of the grand staircase. I would put my hands onto the circular metal rings which had the two olive branch wreath with a third one in the middle. It has since been replaced with a torch the symbol for education. In 1952, Eritrea was federated with Ethiopia. In the process, an elected Eritrean Assembly, commonly known as “Baito Ertra” or in Italian, “L’Assemblea” came into being. There was constitution and a multi party system. Inside this red colored building I played at while waiting for my father. He was made the clerk for the Assembly in the middle of the Federation replacing the first clerk Fergus McCleary from the British Military Administration (BMA). The BMA had handed over power to the Government of Eritrea. I was born at the same time, and as a little girl, I remember seeing the two poles with the Green, Yellow, and Red Ethiopian flag and the Blue flag with Green olive branch in the middle flying under the clouds of Asmara. In the ten years of 1952 until 1962 and even later I heard stories on how the jackal was going to eat the sheep. “Asha Begi ms TeKula Erkenet, Haki tezaribkas ms Naznet” was an ongoing song among the women hanging their wash. When I asked for the names of the sheep and jackal, the poor sheep was the Eritrean Assembly and the jackal was the Ethiopian representative. This was the time of innocence and naiveté. The complexity of the nation’s history was yet to be discovered. I grew up with Eritrean newspapers full of articles about everything from news to films, foreign news, advertising, economics, arguments over the legality of certain bills to be presented to the Assembly, and much more. These papers were collected and were read throughout my childhood. Records of these newspapers are readily available at the Library of Congress and in academic institutions throughout Europe. 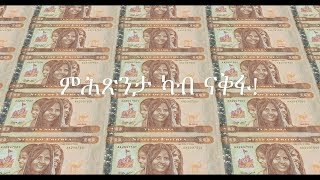 On the web, there is an Eritrean television program regarding the history of the flag. Here many facts are brought up and then in the middle, a certain blurring occurs. It is admitted that there used to be a blue and green flag, and then, a different slant is taken. This was to become the standard in future media reports. First it states that the Eritrean Assembly had voted unanimously for the blue and green flag. Then an episode is introduced that has no purpose except to make this report believable and achieve historical legitimacy. It mentions Mohammed Akito, a member, presenting a drawing of a flag of blue with seven stars. This was just one episode and this draft of a flag was not accepted. In the process it ignores the names of those who participated in the discussion, made changes, finalized it and confirmed it and forwarded to the UN which approved it quickly. It is probable there were other choices or ideas discussed, but, none are noted. This is the standard way of creating a side track in the mind of the viewer. Discussion would focus on a member whose idea was not accepted instead of the process and procedures followed to make a legal flag for the country. “The modern Eritrean nation was created around a combination of symbols, mainly the flag. In 1952, through their elected representatives, Eritrean settled for the blue flag as their common symbol. The flag displays three olive branches on a blue background: two branches with eleven leaves each, hug a third branch which carries twelve leaves. Eritrean nationalism that was symbolized by that flag still rages on; it is the only symbol that Eritreans unanimously agreed upon as a wholly representative symbol, it was the seal that asserted the creation of Eritrea as we know it today. The Eritrean flag was debated, voted for and agreed upon by all the 68 founding members of the Eritrean Council that had a mandate of six-months to prepare the first Eritrean constitution. To those who were alive and mature at the time, the Blue with green olive wreath in the middle was part of everyday life. Asmarinos went up and down the “Compishtato” as they do now. The flag was right in the middle of the street after one passed the Cinema Asmara on the right side, past the little flower shop, then the red building housing the Eritrean Assembly where the two poles showed both the Eritrean and Ethiopian flags. This report on Eri-TV starts with getting the audience to admire the red, green, and blue colors. Then it says that during the occupation/annexation the flag was hidden underground, lost in the cold and wilderness, and was treated as a simple cloth which never received an honorable place due to fear. This is where it begins to belittle the Blue flag. Nowhere in Eritrean history, lore or in the mind of the population, whether Ethiopian or Eritrean, was the Eritrean flag treated as a simple cloth. The next sentence goes to say there are now 400,000 students who raise this symbol of sovereignty every morning and every afternoon showing the present flag. There is no connecting the two sentences. From the first sentence, an unsuspecting viewer may expect to see the Blue flag with the green olive branch to come in from the cold and be the one that is returned to its rightful place on the Eritrean sky. It goes on to teach the audience on the design and color content. It goes back to history of Eritrean Federation and how the flag was the subject of much discussion and that Article 22 was confirmed by the Eritrean Assembly. Then the reporter says “Ametsasa Hbri federation bleka da ayfeleT Ember “ i.e. while no one knows how the color on the Federation flag came about….”!!! If the story had not had a tragic end, this would qualify as absurdly funny due to the nature of the wording. On Saturday, September 13th, 1952, the flag is made official by unanimous vote, the report confirms. In a popular story, members of the Eritrean Assembly, when asked to propose a flag and what it would symbolize, met and after discussions are to have said “Bahri Bahrna, Semai semaina, qoTslie AwleE dma nmerietna” (Blue for our sky and the Sea, and the Olive wreath to show the fertility of the land). Others of the generation have consistently spoken on this discussion. Since it is very hard to hide the truth, even the EPLF/PFDJ report admits that the struggle for independence was "to return the discarded flag" of Eritrea. In its dealing with the Eritrean flag, the EPLF/PFDJ’s role is like the proverb of the grandmother who breaks her earthen cooking pot. If she does it, it is alright and is as if she had washed and put it away. (Adey Abayi TSHali entesebera, Haziben kemzeqemeta). It is acceptable when the EPLF/PFDJ, brings up, discards, calls the flag “a simple cloth, a Federation flag, an ELF flag. If it is deemed necessary, it can make a complete turnabout, go to the cupboard of forgotten items, bring out the Eritrean flag and put it when and wherever it wants to make a national gesture. That is why when the ELF branch, SAGEM, joined the EPLF, the Blue Flag was flying proudly next to the EPLF emblem. In the 1991-1993 periods, it went so far to please the population as putting its emblem and the flag together. Under the Ethiopian occupation, people would talk about “our flag during the Federation years” (bgizie federeshen zneberet banderana). The flag had flown over offices and the papers of the Government of Eritrea had the olive wreath branch in the middle of its stationery. It is hard to say now how many persons had an Eritrean flag inside the country. What happened to the Flag that was officially taken down after “the day of mourning” is a question that I have not been able to answer. For those who were adults in the 1950s, and 1960s, and 1970s latest, almost everyone knew the blue came from the sea and the sky as symbolism with the olive branch for the land. For many years, there were songs, poems, and prose written about this flag with the deepest nostalgia. (awleEi bandera, nEinay nEmbasoira, nEinay, awleEi Sewitye, nEinay…, or ati semaiawit ab dege Hadirki kem arawit..) It was such a given that no one even bothered to clarify that the struggle for independence was to return this flag to its honorable place above the Eritrean sky. For years when a discussion on the flag comes up, “please, not that again” is the first reaction from the 03 propaganda machine. Many Eritreans in the Diaspora who enjoy the time and space to think and work on many subjects have the tendency not to discuss the flag and its symbolism. The EPLF/PFDJ’s manipulation of the Eritrean mind had overcome another hurdle. Dr. Tewolde Tesfamariam, (Wedi Vaccaro) who was an adult at the time of federation mentions Eritrean Assembly members such as Misghina Almedom, Saleh Kebire and Berhanu Ahmedin as being present in the general discussion over the flag. 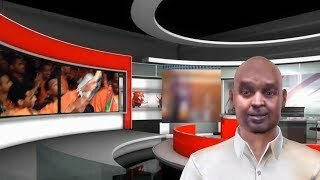 In his interview with TV Adal, Sweden, this former EPLF member and the confidant of its leader, confirms there was no an EPLF meeting with all members that decided on the colors of the present flag. To date even in the news, articles, reports of the opposition it is hard to find Eritrean names associated with events, unless they are dead of course. For example, on writing about the National Service, no one mentions even as introduction or a byline on who was the first to use the word that is now an integral part of the issue. In a series of articles on the Internet it was Adhanom Gebremariam who used the word, slavery. His articles titled, “Wefri Warsay Yekealo, Wefri Barnet” made headlines at the time. The same goes to Eritreans who began the 2% tax issue, “no taxation without representation,” those who opened the subject of women in general and in Sawa in particular to the world, etc. This lack of giving due recognition to individuals is the subject of another whole theme and may need a psychologist and a historian to sort it out. It is interesting to see how the most obvious way to protest against the regime is to choose your subject and do it well. The EHREA webmaster R. Kidane for example has chosen to maintain a website on the dead in Eritrean history. The Eritrean mind set has accepted, respects and acknowledges the work the webmasters of the various opposition sites do. Finally, the Internet had made it possible to interview many former ex-fighters who have started to talk and write. The flag is one of the many simply ignored subjects that when it comes up on a website, attention is diverted to the ethnic or religious origin of the person posting it. That is another way of diverting the issue of a democratically elected group giving its voice to a symbol that it their birthright. A country’s citizens have the birthright to choose a flag, and as one can see below, the population was not given options. The Tower of Asmara may be the people who were a unified group during the Ghedli era but were then cursed by God to become many and talk different languages. Is that why it is difficult for Eritreans to listen? Remember the Tower of Babel, (genbi Babylon)? According to the story humanity was unified and speaking a single language and decided to build a tower to make a name and to reach the skies. But God interfered saying that if they are one, speak the same language, nothing will be impossible for them and what they can achieve. So He decides to mixes up the languages and scatters them across the world and they stop building the city and the tower. The struggle to enter Asmara, as told by many who witnessed, the bravery, valor, honor, sense of justice, egalitarian principles, volunteering to cut across mountains and plains in the fastest possible time, the victories at Afabet and Nakfa, have begotten admirers. On the other side of the coin, the envy that the leader had for these principles, the ways and means of demeaning and destroying the movements’’ pioneers upon inception has led to a two headed monster that has won the battle but not the war. In interviews one can recognize the disgust he feels for Eritrea and Eritreans. It is not hidden. It is all there for all to see in one interview after another. Did Asmara begat the harbinger of her own demise? Who else would state in an open interview, regarding the Diaspora Eritreans, “Do not worry about them, they will only come home horizontally” i.e. in coffins. Maybe hubris is needed to remember and to reconstruct the level of heroism that history so fondly remembers. 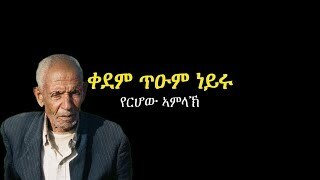 Aba Tewoldeberhan wrote a letter to the Constitution Commission and published it as part of his book titled, “Degi gufuAt”. He had this to say regarding the Article 4/1:“the yellow wreath goes against any symbolism of fertility, as the natural color of olive branch is green, and not yellow. Yellow in Eritrea signifies a plant that is dried, is sick, is old, or is in the process of dying. “ “Degi gfuAt“ had a picture of a young man who had lost both arms due to being shackled in prison on its cover. (A copy of the book cover is available at Asmarino’s picture gallery). The Aba seems to have retired as soon as his book became popular reading. By putting the RED, as blood, it touched the Eritrean psyche whose past held victimization, civil war, and the loss of its youngest members in the effort to topple the hated Green, Yellow, and Red Ethiopian flag. By propagating the common belief in the finding Gold and the history of the Copper mines in Debarewa, the YELLOW color seemed to make sense as it was attributed to minerals. Not many questioned putting in a natural “leaf” in the color of Gold in the flag. Only one, in the person, of Aba Tewoldeberhan, questioned this anathema. The BLUE was a given. Due to cultural, historical, and oral tradition, this color was difficult to ignore. Thus it is said that the EPLF, under the auspices of its leader and the secret party, came up with the idea of a flag with Green, Red, and Blue with Yellow olive branch wreath on it. Due to the emotional baggage that all this carried, few asked why the new flag looked more like the Ethiopian flag it replaced than the original blue and green flag that the fathers in the Eritrean Assembly approved. Here was a flag with Green, Yellow in the middle, and Red, replaced by a Green, Red, and Blue with Yellow in the middle. See how the Eritrean Flag is different than the EPLF and Ethiopian flags. Many EPLF members and sympathizers first saw the flag as it went up on the UN upon the end of the referendum in which the population voted for independence. Good-bye to the Flag: The legal and democratically selected symbol of the nation. The Blue flag as a symbol did not celebrate a happy10th birthday. Its weakening had begun as early as 1952 followed by an official end in 1962. “The Baito members were summoned by Asfaha Woldemichael, Chief Executive, with the doors closing on them once they were in. 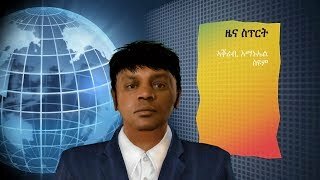 Asfaha read, “………….we hereby unanimously resolve…that the federation…be abolished….and we live with our mother Ethiopia “. After a split second silence, there was applause.”(Wrong, pp. 182). Walking out for the last time from being a parliamentarian, a member, asked my father, in a mixture of Tigre-Tigrinya, „ ata Iyob wedei, eza hagernas bHanti TaQit gesset? My father, replied, ewe, gesset. (Our country is gone with the clapping of hands). I heard the story many times, but was too young to understand its ramifications. My father died at the age of 52 in 1977. I regret to this day that I never asked. We were all young with the know-it-all hubris of the time. How could we have foreseen that this generation would see the overthrow of two Ethiopian regimes, the Imperial one, and the Military Dergue, and welcome independence? How many witnesses to history are now left to give their real life interviews/ memoirs on what happened during these 10 years of Federation, the Imperial days as a province, occupation under the Dergue and a free country? There are now individuals who are talking out loud and printing books; however, compared to the overall population they are still a few in number. Back to the flag, the question now is why is the side that sees itself as the precursor (the leader) on the road to legality, democratic elections, national fervor, humanitarian, and renaissance of traditional culture is leading demonstrations under the banner of a flag brought about through loss of youth, blood, handicapped, forgotten, and discarded fighters of one generation and the youth, blood, body parts, slave labor of another generation? Does the reasoning that the ELF was welcoming its brothers and sisters from the EPLF and that this was “their” flag hold water at this stage? Peaceful movements across the world among other things tend to burn the flag that symbolizes their frustration with the status quo. Eritreans in the Diaspora are the only ones to date that have not done this act as a protest. This protest against a national flag is made to make a political point against the country or its policies. Yet, the opposition seems to take the flag of the oppressor and give it undue respect by waving it across the globe while protesting. If a foreigner looks at an opposition demonstration across the street from a PFDJ event, there would be the question of who is who in the flag waving side. Some Eritreans have given up on trying to tell the true tale on the birth of the present flag and its implication as a birthstone of a despot; a despot that is being accused of international crimes and the extinction of a population. ASMEA, (the Association of the Middle East and Africa) published on Jul 25, 2012, has this brief talk by Dr. Gerard Prunier about Eritrea. The report deals with the way the government is set up, its disreputable and illegal undertakings internationally, and the problems facing the Eritrean people. This singularly devastating report on “Africa’s North Korea” begins by saying that…”It is a very very strange strange country” and confirms that a secret party controlling every aspect of the movement’s actions existed in the EPLF unknown to its thousands of members inside and outside the country. This reminded the lecturer of Russian dolls in which one is found inside another, and another, until a small kernel doll is left. This kernel is what is surviving at present. Those 15or so leaders who were the insiders of the regime that has usurped power are now dead or in jail waiting to die. On August 15th, 2012, Eritrea’s flag-carrying runner asked asylum in UK. How many more have done so to date? Did someone asked him how he felt about the flag that he threw away in order to ask for asylum? What about all the young people who march under this flag in Sawa? How do they feel about this flag that uses them for fanfare of celebrations while becoming dependent on their slave labor to run a country? A strange country indeed. In the meantime, Eritreans abroad are posting their own video version of the tragedy with the title, Eritrea, a country on the edge of an abyss. This is the country that this flag represents, a country with a dying green leaf.